Internal friction in solids. Viscoelasticity. 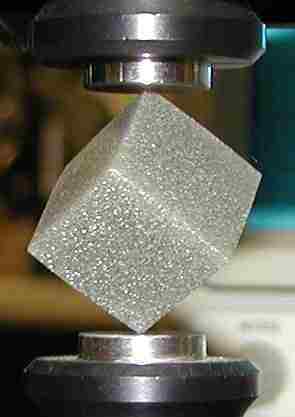 Anelastic solids. Viscoelastic materials are those for which the relationship between stress and strain depends on time or, in the frequency domain, on frequency. The slope of a plot of stress vs. strain depends on strain rate. Anelastic solids represent a subset of viscoelastic materials: they have a unique equilibrium configuration and ultimately recover fully after removal of a transient load. After being squeezed, they return to their original shape, given enough time. Our laboratory is capable of viscoelastic measurements of materials which exhibit anelastic response or internal friction, under isothermal conditions, over as much as eleven decades (a factor of 10 11) of time and frequency, with no appeal to time-temperature superposition. Experimental studies of anelastic, hysteresis, and viscoelastic creep behavior have been conducted with this viscoelastic instrument (broadband viscoelastic spectroscopy or BVS) on solder, alloys, biological materials, biomaterials, high-loss elastomers, cellular solids such as foams, and composites. Many reported experiments are at ambient temperature and cover a wide range of frequency; we can also study materials at temperatures above or below ambient. We also use resonant ultrasound spectroscopy (RUS) in viscoelastic measurements. To illustrate effects of internal friction, anelastic behavior or material damping, listen to the sound of tuning forks with different damping, in this demonstration. Rod Lakes, Viscoelastic solids, CRC Press, Boca Raton, FL, (1998). Rod Lakes, Viscoelastic Materials, Cambridge University Press, (2009). Rod Lakes and John Quackenbush, "Viscoelastic behaviour in indium tin alloys over a wide range of frequency and time", Philosophical Magazine Letters, 74, 227-232 (1996). Lakes, R. S., "Thermoelastic damping in materials with a complex coefficient of thermal expansion. ", J. Mechanical Behav. Mts., 8, 201-216, (1997). Amada, S. and Lakes, R. S., "Viscoelastic properties of bamboo", Journal of Materials Science, 32, 2693-2697, (1997). Get article pdf Viscoelastic properties of bamboo were measured over a range of frequency. Gibiansky, L. V. and Lakes, R. S., "Bounds on the complex bulk and shear moduli of a two-dimensional two-phase viscoelastic composite", Mechanics of Materials, 25, 79-95, (1997). The effective complex moduli of an isotropic two-phase, two-dimensional viscoelastic composite material are analyzed in terms of the complex moduli of its phases. The frequency range is assumed to be well below frequencies associated with the inertial terms; the acoustic wavelength is much larger than the inhomogeneities. Bounds are developed for the complex bulk modulus K* = K' + iK'' and complex shear modulus G* = G' + iG'' of the composite with arbitrary phase volume fractions. Shear modulus bounds are obtained subject to one scalar restriction on the phase viscoelastic properties which is valid, in particular, for the phases with real and equal Poisson's ratios. Each of the moduli is shown to be constrained to a lens-shaped region bounded by two circular arcs in the complex bulk or shear modulus planes. The bounds are investigated numerically to explore conditions which give rise to high loss combined with high stiffness. Composite microstructures corresponding to various points on the circular arcs are identified. Influence of anisotropy of the composite on the stiffness-loss map for the bulk and shear type loads are analyzed. Boyer, D. B., Papadogiannis, Y., Park, H. C., and Lakes, R. S., "Viscoelasticity and aging of dental composites. ", Bio-Medical Materials and Engineering, 8, 45-53, (1998). Effects of aging on several dental composites were studied using a torsion creep apparatus. A constant torque was applied from 1 sec to 3 h, and recovery was observed from 10 sec to two days, for specimens aged from 3 hours to 8 weeks following polymerization. Specimens aged for shorter times exhibited more creep and less complete recovery than specimens aged for longer times. Modulus and viscoelastic creep results were qualitatively consistent with a composite model for particulate inclusions. The specimen is contained within the brass enclosure to the left in this lab image. Edwards, L. K., Nixon, W. A., and Lakes, R. S., "Viscoelastic behavior of 80In15Pb5Ag and 50Sn50Pb alloys: experiment and modeling", J. Appl. Physics, 87(3), 1135-1140, (2000). Lakes, R. S., "Viscoelastic measurement techniques", Review of Scientific Instruments, 75, 797-810, April (2004). Wang, Y. C., Ludwigson, M., and Lakes, R. S., "Deformation of extreme viscoelastic metals and composites" Materials Science and Engineering A, 370, 41-49, April (2004). Jaglinski, T. and Lakes, R. S., "Creep Behavior of Al-Si Die-Cast Alloys", Journal of Engineering Materials and Technology, 126, 378-382, Oct. (2004). Oza, A., Mccabe, R. Vanderby, R. and Lakes, R. S., "Logarithmic pulse generator for long-term creep and relaxation testing ", Rev. Sci. Instr. 76, 056102, 1-3, April (2005). Burgers, T. A., Lakes, R. S., Sylvana Garcia-Rodriguez, S., Piller, G. R., Ploeg, H., "Post-yield relaxation behavior of bovine cancellous bone", Journal of Biomechanics, 42, 2728-2733, (2009). Dong, L. Stone, D. S., Lakes, R. S., "Softening of bulk modulus and negative Poisson's ratio in barium titanate ceramic near the Curie point", Philosophical Magazine Lett. 90, 23-33, Jan. (2010). Formal reprints are available; if you want one, please request it. Get informal pdf. Dong, L., Stone, D. S., and Lakes, R. S., "Sharp low frequency dissipative effects in tetragonal BaTiO3 ceramics,"J. Appl. Physics 107, 023514 (2010). get pdf. Copyright American Institute of Physics AIP link. Mechanical anomalies, damping peaks sharper than Debye peaks, in contrast to a broad relaxation peak, were observed in tetragonal barium titanate ceramic via broadband viscoelastic spectroscopy at low frequencies (10 Hz) at ambient temperature after aging at 90 degrees C for 15 h. The sharp peaks disappear after aging above the Curie point (150 degrees C) for 10 h. Mechanical anomalies are tentatively attributed to negative stiffness heterogeneity. Dong, L., Stone, D. S., and Lakes, R. S., "Anlastic anomalies and negative Poisson's ratio in tetragonal BaTiO3 ceramics", Applied Phys. Lett. 96, 141904 (2010). Anelastic anomalies, sharp variations in modulus and damping with temperature, were observed in tetragonal BaTiO3 via broadband viscoelastic spectroscopy after aging at 50 deg C for 15 h. The effect was most pronounced under electrical short circuit condition, at low frequency and under small excitation strain 10-6. Softening in bulk modulus and negative Poisson's ratio were observed near 60 deg C. Effects are attributed to an oxygen vacancy mechanism. A relaxational model cannot account for sharp response at smaller strains. Heterogeneity of negative stiffness is considered as a cause. APL link. get pdf. Dong, L., Stone, D. S., and Lakes, R. S., "Viscoelastic and dielectric properties of 3% KNbO3 - BaTiO3 ceramics", Physica Status Solidi, 248 (1), 158-166 (2011). Viscoelastic behavior (modulus and damping) of polycrystalline 3%KNbO3-BaTiO3 has been studied in torsion and bending via broadband viscoelastic spectroscopy (BVS) over a range of temperature passing through both the orthorhombic-to-tetragonal and tetragonal-to-cubic phase transformations. Softening in bulk modulus and minima in Poisson's ratio as well as peaks in mechanical damping, dielectric constant, and heat capacity vs. temperature were observed in the vicinity of the transformations. Viscoelastic response vs. temperature was sharper than dielectric or thermal response. Transition temperatures of both transformations shifted to lower temperatures in comparison to pure BaTiO3. Damping peaks vs. temperature were wider (5 deg. C) than in pure BaTiO3 (less than 1 deg. C) and of smaller magnitude. Broadening of response is attributed to material heterogeneity on a fine scale. get pdf. Journal link, online version. Jaglinski and Lakes, R. S., "Resonant ultrasound spectroscopy of cylinders over the full range of Poisson's ratio" Rev. Sci. Instr. 82, 035105 (2011). Mode structure maps for freely vibrating cylinders over a range of Poisson's ratio are desirable for the design and interpretation of experiments using resonant ultrasound spectroscopy (RUS). The full range of isotropic Poisson's ratio (-1 to +0.5) is analyzed here using a finite element method to accommodate materials with a negative Poisson's ratio. The fundamental torsional mode has the lowest frequency provided Poisson's ratio is between about -0.24 and +0.5. For any Poisson's ratio, the torsional mode can be identified utilizing the polarization sensitivity of the shear transducers. RUS experimental results for materials with Poisson's ratio +0.3, +0.16, and -0.3 and a previous numerical study for Poisson's ratio = 0.33 are compared with the present analysis. Interpretation of results is easiest if the length/diameter ratio of the cylinder is close to 1. Slight material anisotropy leads to splitting of the higher modes but not of the fundamental torsion mode. get pdf. Journal link, online version. Composite materials containing particulate BaTiO3 inclusion have been fabricated with BaZrO3-ZnO as the matrix. Giant anelastic responses (abrupt increase in modulus and damping vs. temperature) have been observed after 75 deg. C aging 24 h in these composites in thetemperature region far below the Curie point of BaTiO3. Anomalies disappeared after 185 deg. C aging 4 h. Such responses are attributed to the constraining negative-stiffness effect of the inclusion. An oxygen vacancy mechanism has been discussed which is considered to be responsible for the negative-stiffness effect. The present work is novel in terms of the idea of manipulation of negative stiffness in ferroelastic inclusions to achieve the desired composite properties. Dong, L., Stone, D. S., and Lakes, R. S., "Extreme anelastic responses in Zn80Al20 matrix composite materials containing BaTiO3 inclusion", Scripta Materialia, 65, (4), 288-291, August (2011). Extreme anelastic responses (stiffness greater than diamond and large amplification of damping) due to the presence of a negative stiffness phase have been observed in Zn80Al20-BaTiO3 composites not only near the tetragonal- orthorhombic transformation temperatures of BaTiO3 anticipated by the classical Landau theory, but far below the Curie point of BaTiO3 which can be manipulated via specific aging processes that operated by an oxygen vacancy mechanism. The idea proposed herein can be utilized to fabricate novel composites for potential engineering applications. Journal link, Scripta Mat., get pdf. Delgadillo, R., Bahia, H.., and Lakes, R. S., "A nonlinear constitutive equation for asphalt binders", Materials and Structures, online (2011); 45, 457-473 (2012). get pdf. Dong, L, and Lakes, R. S., "Frequency dependence of Poisson's ratio of viscoelastic elastomer foam", Cellular Polymers, 30, 277-285, (2011). All polymer foams are viscoelastic; for foams used in earplugs, this response is essential to their function. Poisson's ratio was inferred from viscoelastic response of earplug foam in torsion and bending. Poisson's ratio increases with frequency as a result of stress induced air flow. Air within the pores contributes to the overall bulk modulus at high frequency, but not at low frequency at which it easily flows when the foam is deformed. Such behaviour is the opposite of that of solid polymers in which the shear modulus varies with frequency much more than the bulk modulus. The frequency dependent Poisson's ratio is related by Fourier transform to the time dependent Poisson's ratio. get pdf. Kalathur, H., Lakes, R. S., "Column dampers with negative stiffness: high damping at small amplitude", Smart Materials, 22, 084013 (8pp) (2013). High structural damping combined with high initial stiffness is achieved at small amplitude via negative stiffness elements. These elements consist of columns in the vicinity of the post-buckling transition between contact of flat surfaces and edges of the ends for which negative incremental structural stiffness occurs. The column configuration provides a high initial structural stiffness equal to the intrinsic stiffness of the column material. Columns of the polymers polymethyl methacrylate (PMMA) and polycarbonate were used. By tuning the pre-strain, a very high mechanical damping was achieved for small amplitude oscillations. The product of effective stiffness and effective damping as a figure of merit |E tan delta| effective of about 1.5 GPa was achieved for polymer column dampers in the linear domain and about 1.62 GPa in the small amplitude nonlinear domain. For most materials this value generally never exceeds 0.6 GPa. journal link. get preprint pdf.